Goldclover, along with Tiger Lily, is the first tier herb in Wrath of the Lich King. This makes it usually the cheapest herb to buy on the auction house when players level their Inscription and need a level 70-80 herb. It’s also relatively rare because players don’t exactly go back to Northrend and farm this stuff. Farming Goldclover is pretty easy and I’ll give you several options to do it below. Goldclover sells best in stacks of 10 and 20 between 1 and 7 gold per herb, that’s 20 gold to 140 gold per stack. Obviously check your auction house to see what prices are before you farm too much of this. You should be at least level 68 before you try to farm this. An epic flying mount is a huge bonus, to get that at level 68 you’ll need Cold Weather Flying. Update: You can make a lot of gold with Goldclover, but if you want to step it up and make thousands of gold you should read my personal favorite guide. 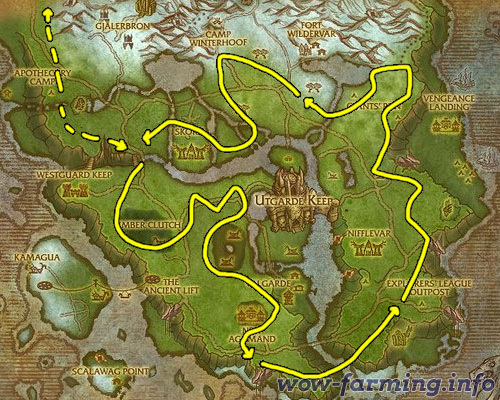 The best place to farm Goldclover is in Sholazar Basin because you will find a lot of Tiger Lily and Adder’s Tongue as the same time. Combined, these 3 herbs will make it easier to actually profit off your farming. The below route is my general Goldclover/Tiger Lily/Adder’s Tongue route and works really well once you get it down. 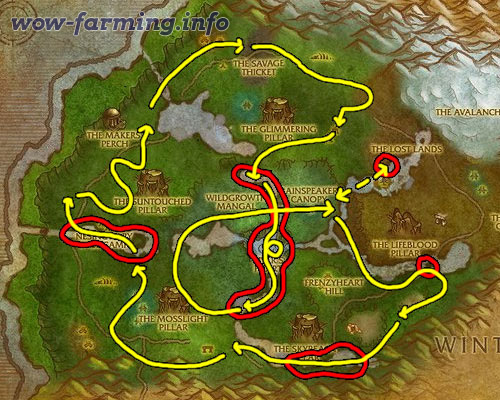 The red highlights places where you will find Tiger Lily, the yellow line is what you should follow around the zone.